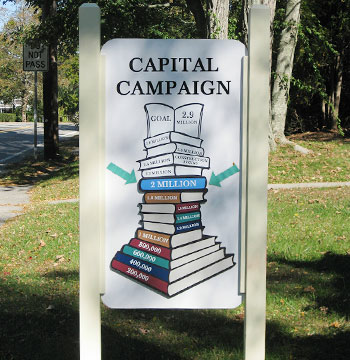 In 2013 the West Falmouth Library launched a $2.9 million capital improvement campaign, “Taking the Library into the Future,” and by early 2016 had raised over $2 million. This included a $120,000 grant appropriated from the CPFund in 2014 to contribute to restoration of some of the historic exterior and interior architectural components of the Library. Five young women who wanted to enrich their lives in the quiet farming village of West Falmouth in the mid 1870s formed The Young People’s Union, a club that met weekly for musical and literary programs. A group of village men built the first library building, on Depot Street, and later it was moved near the West Falmouth Market. In 1891 the West Falmouth Library Association replaced The Young People’s Union and the organization was chartered in 1893 with 800 books in its possession. The Mendenhalls of Minneapolis donated land at 575 West Falmouth Highway and in 1896, the current library building was built on the property with the generous support of D. Wheeler Swift. The library opened to the public in 2007 and continues to serve West Falmouth and all of Falmouth through the CLAMS library network, cultural programs and other community events. The capital plan includes safety and access improvements, additional program space, climate-controlled archive space, the development of new outdoor spaces, and restoration and preservation of the 1896 historic library building. Historic restoration and preservation include improved archival storage and display space and a sprinkler system to protect the historic building. Exterior work will preserve where possible and replace where necessary the original clapboards, shingles, trim, soffits, brackets, doors and windows. Additional masonry restoration will be necessary for the fieldstone foundation and the entry stairway and landing. The entry vestibule, community room and main reading room will have work done to restore and preserve the original plaster walls, ceilings, woodwork, bookshelves, built-in benches, hardwood floors and the coiling door system between the community and main reading rooms. The existing non-original light fixtures will be replaced with historically appropriate ones. In 2017 the Library asked for an additional $122,500 in community preservation funds to continue and complete the planned restoration of the building’s historic interior and exterior. Town Meeting appropriated the funds at its April 2017 meeting, allowing the Library to continue its restoration work without interruption. The Library is a key structure in the West Falmouth’s National Register Historic District as well as the Town of Falmouth’s Historic District. It plays a central role in Falmouth for poetry readings, concerts, lectures, and other cultural activities.